The RailGiants Store is inside the historic Santa Fe railroad Arcadia Depot and has a great selection of train souvenirs. Our souvenirs include custom designed tee shirts, hats, photos and prints, calendars, books, and DVD videos. While many are themed after the locomotives in our collection, they also include famous Big Boy #4014, other railroad locomotives, and trains in general. For the railfan in training, we also have train related toys for many age groups. The RailGiants Store is open every day RailGiants Train Museum is open during our open house weekends, the Los Angeles County Fair, and other special events. We also operate booths at select train events in Southern California and Cheyenne Wyoming, where we sell a limited selection of souvenirs. Check our schedule to view the events we'll attend and dates. Listen to historic sound recordings of many famous steam locomotives recorded in the 1950s. Digitally Remastered from recordings by: Edward P. Ripley III, Stan Kistler, and Lewis Harris. Due to the popularity of these unique historical recordings, we are offering you this limited time offer to obtain your own copy. Purchase your CD on-line with PayPal from your PayPal account or major credit card. $10.00 per CD, plus $4.25 Post Office Media Mail shipping (up to four CDs) within United States. Delivery up to eight business days after mailing. Price includes sales tax for CDs mailed within California. $10.00 per CD, plus $7.90 Post Office Priority Mail shipping (up to four CDs) within United States. Delivery up to three business days after mailing. Price includes sales tax for CDs mailed within California. RailGiants Store fulfillment staff will mail your CD within a few days after we received your order. We accept on-line orders when the product is in stock. If we are sold-out, it's temporary and we're waiting for new supplies to arrive, so check back soon. Want to have your order shipped outside United States? Please contact us for pricing. Due to popular demand, we've sold out on several popular Big Boy items, and hope to have more available in the future. 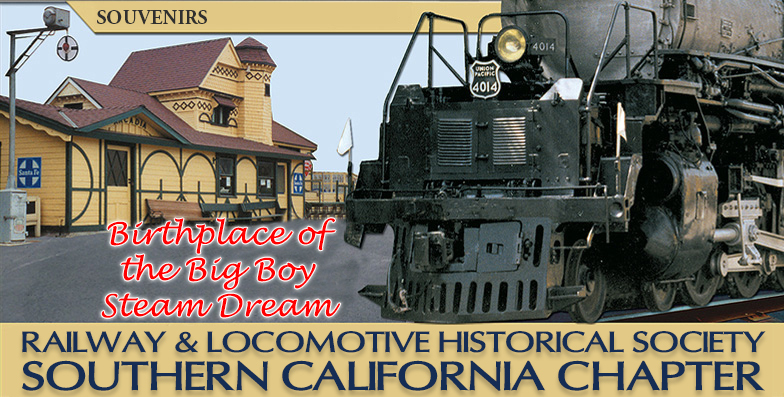 We have many more gifts available during your next visit to the RailGiants Store in Pomona, including tee shirts illustrating many of our locomotives. 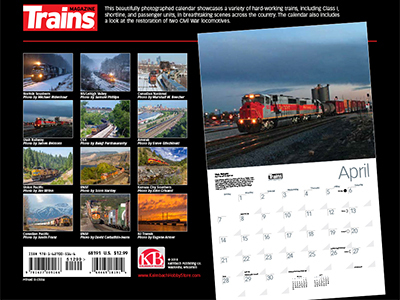 Trains Magazine's special issue magazine broke all sales records. The perfect keepsake and gift for anyone wanting to read-up on the history and events up to the journey from West Colton to Cheyenne. Regrettably, the paper version is now out of print. Their DVD is the best production we've ever seen on the Big Boy. It includes its history, the journey to Cheyenne, and an extensive top to bottom, front to back tour of No. 4014 by Ed Dickens. The location of each locomotive today. Features historic photos from Stan Kistler's trip to capture Union Pacific's final years of steam operation in Wyoming and Nebraska. A perfect companion to our Steam Echoes II sound CD. Perfect for any steam railfan's shirt or jacket to display their interest in the most popular Big Boy locomotive. About the size of your thumb. 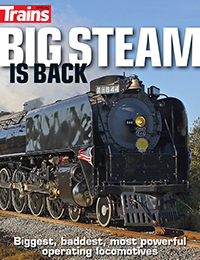 Big Steam is Back ! 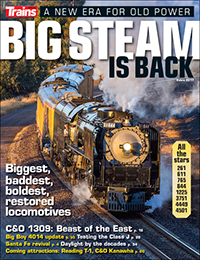 This special edition magazine features 11 well-known locomotives from across the United States and their individual journeys to restoration. 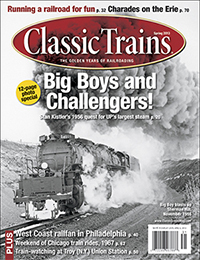 This special 100-page edition includes the restored Norfolk & Western Class J No. 611, widely considered to be the best and most powerful locomotive ever built, the colorful Southern Pacific No. 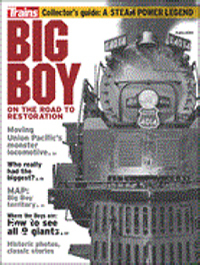 4449, and an update on the much-anticipated completion of Big Boy No. 4014. 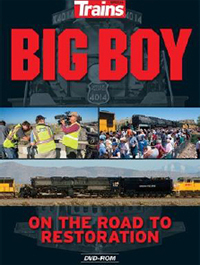 The companion DVD shows how many operating big steam locomotives are rebuilt and run — from Tennessee Valley Railroad Museum's Southern Railway No. 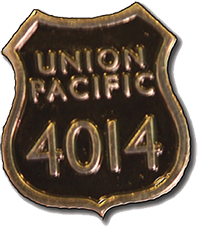 4501, to the big steam story of 2016: the return of Union Pacific No. 844. 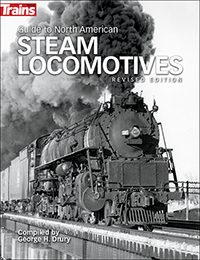 This must-see DVD includes popular steam locomotives from coast to coast. This all-new DVD is a wonderful companion to the 100-page special edition, Big Steam is Back. The 90-minute video covers the early years of steam preservation through today's biggest restorations! 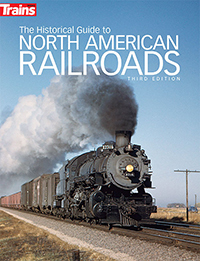 This newly revamped book features every steam locomotive built in the U.S., Mexico, and Canada since 1900. This is an essential guide that should be in the library of every railfan! Comprehensive rosters for every railroad. Information and data railfans can't find anywhere else. 420 photos and newly designed roster tables. The ultimate railroad reference book for rail fans and history buffs. All major and many minor railroads from the past 100 years are included. Statistics highlight miles of operation, locomotives, and rolling stock.